Easter is all about munching away on chocolate (it’s our favourite part of the holiday!) so to get you ready for this scrumptious occasion Maxine has created this awesome wrapper that anyone would love to receive! 1. Cut a piece of Simply Creative So Chic navy 12x12 paper down to fit around your chocolate bar. Wrap your sheet around the chocolate and adhere the ends together, at the back of the chocolate bar, with Dovecraft Perma Fix Tape. 2. Cut a piece of First Edition blue textured card, to fit the front of your chocolate bar, allowing room for a border. Adhere to the front of the chocolate wrap with Dovecraft Perma Fix Tape. 3. 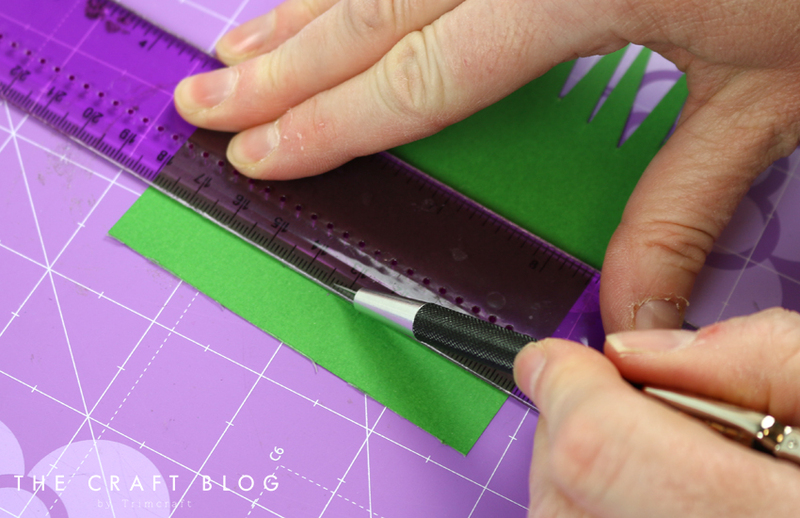 Next, cut a piece of green, First Edition Textured Card Stock to fit the width of your bar. Cut small slits along the top to create the look of grass. 4. Measure 1.5cm from the bottom of your grass sheet, in the middle and make a mark. From this mark, cut a horizontal slit. 5. Cut a strip of white card 1.8cm wide and about 3cm shorter than the blue piece of card stock and thread it through your grass sheet. Add foam tape to the sides of the grass sheet and adhere to your chocolate wrap. 6. Use the Fiskars circle punch to punch out a circle of white card, cut in half. Stamp the word ‘pull’ with the Dovecraft Alphabet stamp set. 7. Glue the ‘pull’ semi circle to the bottom of the white strip and adhere the other half of the circle to the back to make it more secure. 8. Die cut the cloud and sun from the first edition weather die set on to your chosen First Edition coloured card stock. Adhere both die cuts to the top of the chocolate wrap, with glue. 9. 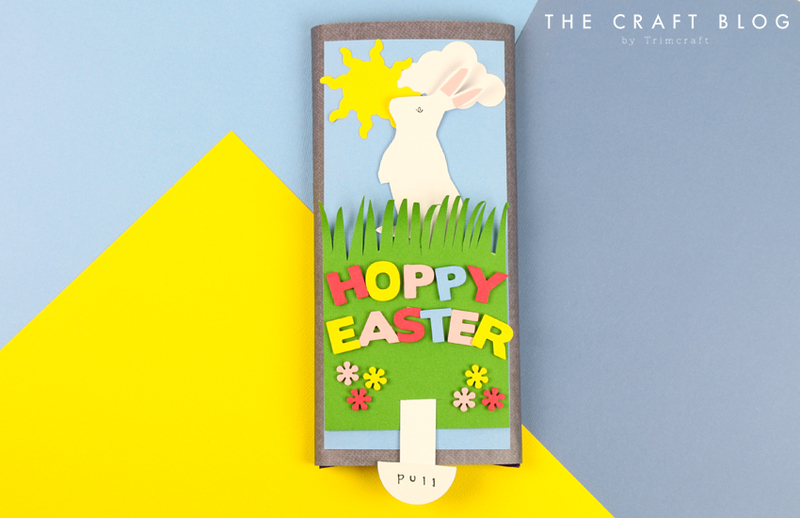 Next, die cut the words, ‘Hoppy Easter’ on to First Edition Textured card in a variety of colours and adhere to the bottom of your chocolate wrap with 3D foam pads. Die cut a selection of Dovecraft Flower dies on to a variety of coloured card and stick them underneath the sentiment. 6. Cut out your chosen rabbit from the free template on to white First Edition Textured card stock. Use the ‘a’ from the alphabet stamp set to make the eye on the rabbit. Cut two pink triangles for the ears and adhere with glue. 7. With Dovecraft Perma Fix tape, stick your bunny to the top of your white strip. 8. Curl the grass with a pokey tool – this will stop the rabbit getting stuck in the grass when moving. This chocolate wrapper is not only pleasing to the eye but is so much fun to play with as well! How will you use our free chocolate wrapper template? We would love to see so don’t forget to share them in the inspiration area and to #trimcraft when uploading to social media.